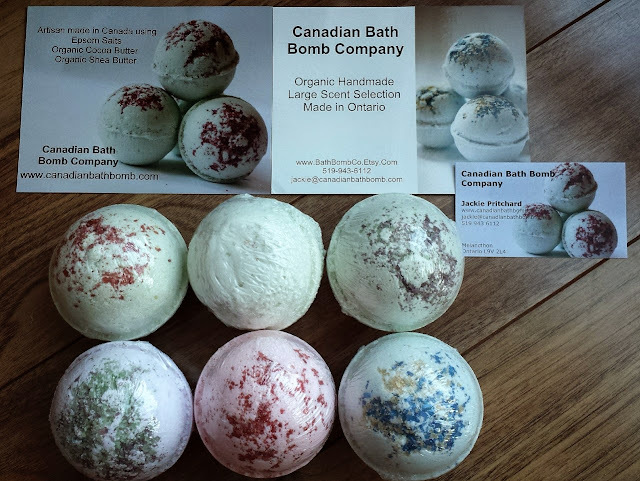 Intro: These quality bath bombs are made by Jackie in her studio, using organic oils and butters - they also come in a plethora of amazing scents, and trust me, they all smell AMAZING!!! Jackie uses skin soothing Epsom salts with a blend of certified organic cocoa butter, shea butter and canola oil to transform your bath time into a luxury spa experience all in your very own bath tub. Each bath bomb is decorated with mica colored Epsom salts or pink Himalayan salt for a splash of color. 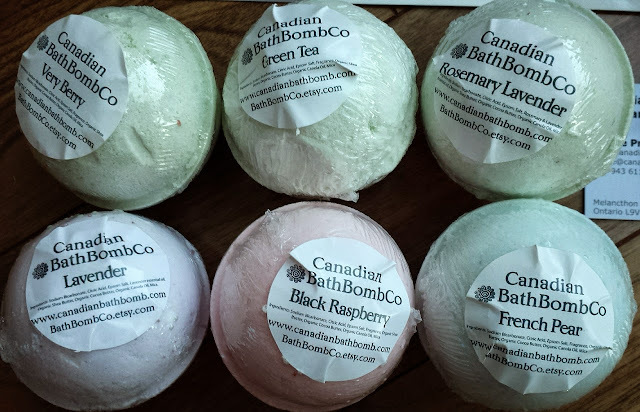 Jackie adds the extra touch by individually wrapping each bath bomb in a clear plastic wrap so that you are able to enjoy the scents when you aren't using them yet so they all stay clean and hygienic. Each bath bomb is labelled individually so that you can easily pick out which one you want when the time comes. 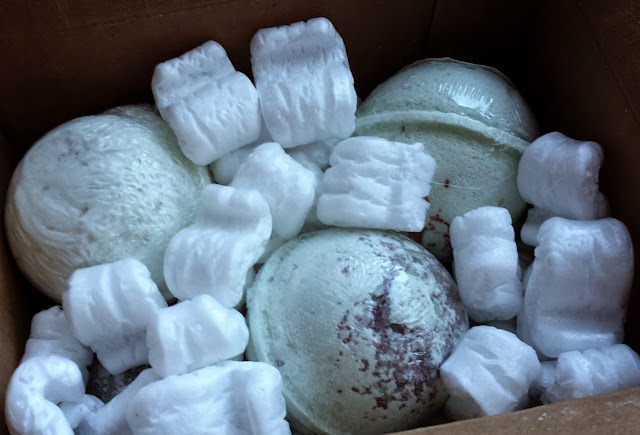 Bath bombs come packaged in a box with foam chips to make sure they stay intact! 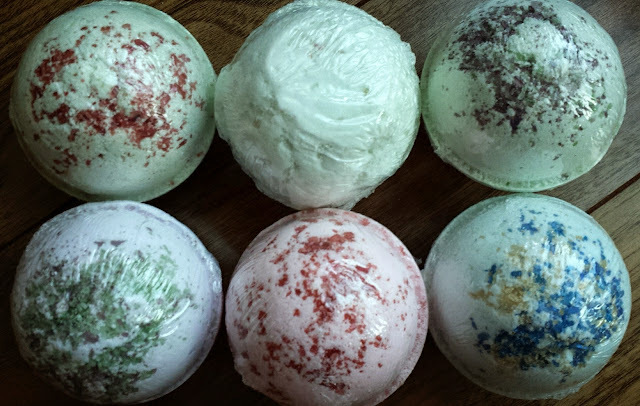 Pictured below are 6 bath bombs (names are pictured below, I included pictures front and back). 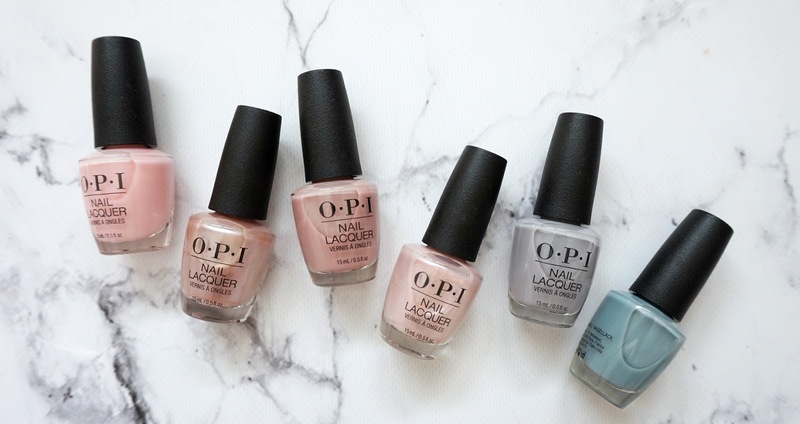 My favorite one is Black Raspberry, followed by a tie of Green Tea and Rosemary Lavender. The Rosemary Lavender smelled so relaxing. I dropped this under running warm water and when the oils mixed with the steam, it cleared my senses and immediately relaxed me. I used this after my recent game of tennis and it worked out my kinks in my lower back, legs and shoulders.My skin was so soft after soaking in the medley of oils - Side note: Epson salt does wonders for your skin - they always say whenever you take a bath, you should always add Epson salt as it helps to detox you naturally. My girlfriends, hubs and even guy friends all asked me what that amazing smell was when they walked into my condo, I had the bombs stacked on a tray in my washroom and it scented my condo - it's amazing! The smell gets even stronger when released in water, so you know that Jackie is using nothing but quality products. It doesn't lose any fragrance whatsoever. I am already planning my next order which will be: Pink Sugar, Vanilla Bon Bon, Ginger Papaya and Mandarin Pomander. I can't wait!!! 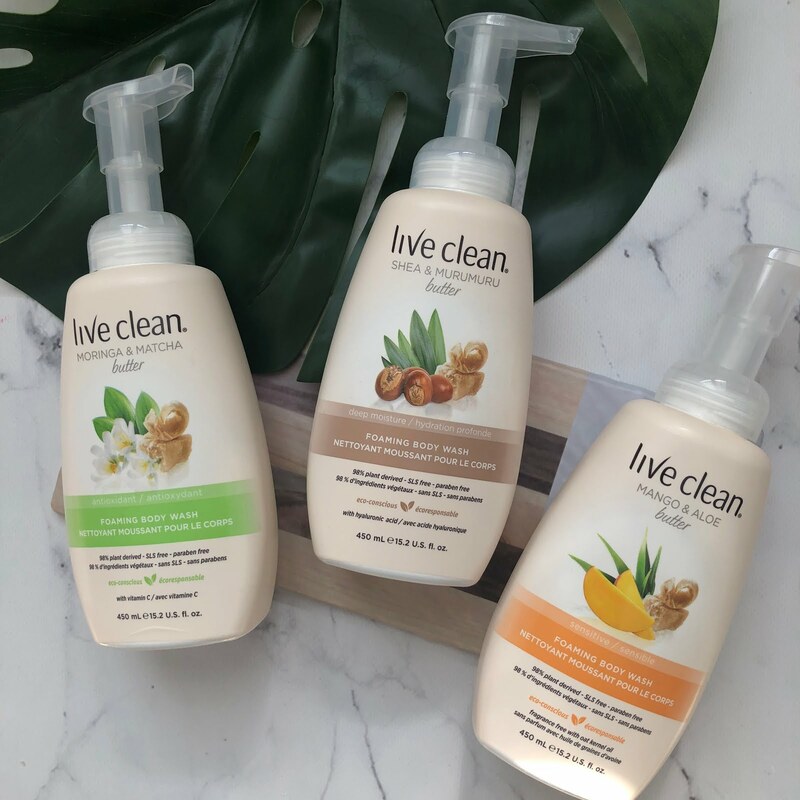 I hope that you will give Jackie's products a try, it's Canadian and crafted with love!